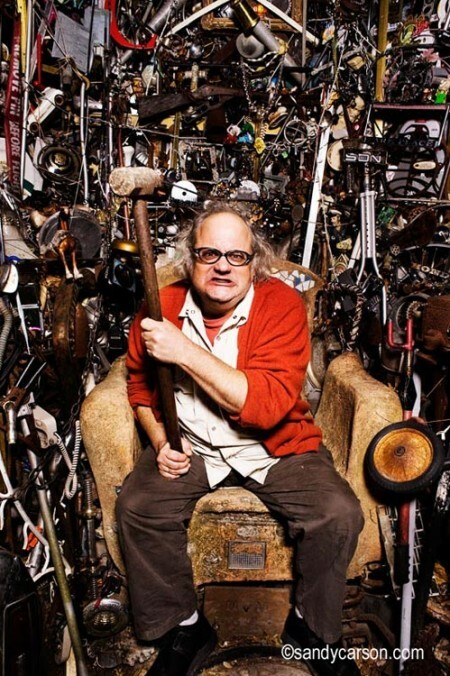 (photo: Sandy Carson) Eugene Chadbourne is a legendary improvising guitarist/banjo player, as well as a virtuoso on various noisy instruments of his own design and construction. As a major player in the improvised music scene since the 1970s, Chadbourne has worked with a huge range of players including John Zorn, Fred Frith, Derek Bailey, Han Bennink, Jimmy Carl Black, Carla Bley, Anthony Braxton, Camper van Beethoven, Toshinori Kondo, Paul Lovens, Frank Lowe, Sun City Girls, They Might Be Giants, and a host of other luminaries you would/should recognize. A long-time resident of Greensboro, North Carolina, “Doc Chadula” has also performed original folk/protest songs, free-improvised country & western be-bop, and crazed psychedelia with the seminal band Shockabilly. He is a keen commentator on the music scene and has written extensively for a number of music magazines over the years. His web site contains a vast storehouse of his writings and recordings. Go there now! Sharing the evening are MURAL, a trio consisting of Norwegians Kim Myhr (guitar) and Ingar Zach (percussion), and Australian saxophonist Jim Denley. MURAL reveals large sound-surfaces that stretch across registers and territories. Several plateaus of sound happen simultaneously, reaching some “plane of consistency” where the music can dwell while discovering its own simmering nuances. The smallest vibrations can appear as monoliths: consistent, but changing when moving forward through time. MURAL creates large spaces, luminous rooms of various shapes.